In a pair of games last week Stark averaged 21.0 points, 5.0 rebounds, 3.5 assists and 3.0 steals/game while hitting 42.4 percent (14-of-33) from the field, 47.1 percent (8-of-17) from 3-point range and 6-of-6 from the free throw line. The Preseason OVC Player of the Year opened the week with 21 points on 5-of-11 3-point shooting in a home game against SEC foe Auburn. He had five rebounds, five steals, five assists and a block in the contest. 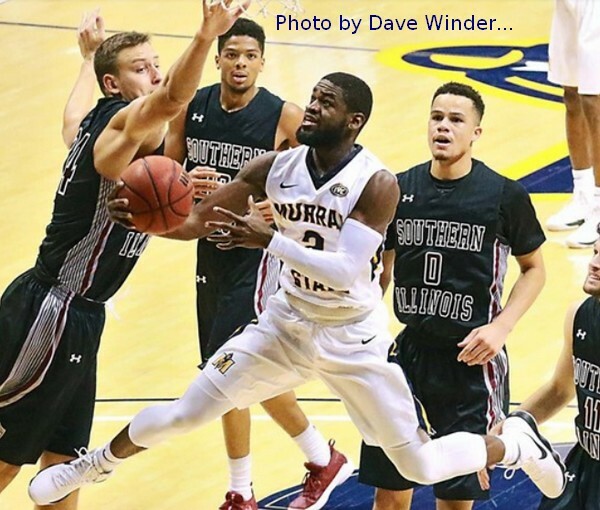 He followed that by once again scoring 21 points, this time in a win at Detroit Mercy. Stark hit 3-of-6 3-pointers and added five rebounds, two assists and a steal. In 76 total minutes of play, Stark committed only six turnovers. Stark currently ranks second in the OVC in 3-pointers made/game (2.9), fifth in assists (4.0/game) and minutes played (33.6/game), sixth in assist-to-turnover ratio (2.2) and seventh in scoring (16.3 points/game) and steals (1.5/game). He is the seventh different player in seven weeks to earn OVC Player of the Week honors. Others Nominated: Terry Taylor, Austin Peay; Dylan Windler, Belmont; Muusa Dama, Eastern Illinois; Nick Mayo, Eastern Kentucky; Malcolm Drumwright, Jacksonville State; Djimon Henson, Morehead State; Christian Ellis, SIUE; Christian Mekowulu, Tennessee State; Fatodd Lewis, UT Martin. Ugba, a transfer from Grambling, averaged 13.0 points, 7.0 rebounds and 1.0 steals/game while hitting 42.9 percent (9-of-21) from the field and 70 percent (7-of-10) from the free throw line. He had 16 points, five rebounds, an assist and steal as the team overcame an 11-point second half deficit to defeat Troy 75-73. In that game he hit 6-of-11 field goals and 4-of-4 free throws. Ugba closed the week with 10 points, nine rebounds and a steal against Western Kentucky. In two games last week Davis, a transfer from Butler, averaged 16.0 points, 4.0 rebounds, 2.5 steals and 1.0 blocks/game while hitting 59.1 percent (13-of-22) from the field and 85.7 percent (6-of-7) from the free throw line. Jackson opened the week with 15 points, two rebounds, two blocks and a steal in 18 minutes of action in a win over Norfolk State. He hit 6-of-9 field goals and 3-of-4 free throws in the game. Followed that with a season-high 17 points to go along with six rebounds, four steals and an assist at Marshall; hit 7-of-13 (53.8%) from the field and 3-of-3 from the free throw line in the contest. Others Nominated: D’Angelo Jackson, Eastern Illinois; Jason Burnell, Jacksonville State; Terrence Parker, UT Martin. In two games last week Morant averaged 13.0 points, 9.0 rebounds, 7.0 assists and 1.0 steals/game while hitting 80 percent (8-of-10) at the free throw line. In the team’s 81-72 win at Detroit Mercy, the freshman nearly recorded a triple-double as he tallied 17 points, 11 rebounds and nine assists. In that contest he hit 6-of-11 field goals, 2-of-4 3-pointers and all three of his free throw attempts. He opened the week with nine points, seven rebounds, five assists and a steal in an 81-77 home loss to SEC foe Auburn. Morant is the top rebounding guard in the OVC (6.5/game), leads the OVC in assist-to-turnover ratio (3.2) and is second in each assists (6.7/game) and free throw percentage (87.5%). Others Nominated: Terry Taylor, Austin Peay; Nick Hopkins, Belmont. OVC Overview/This Week’s Highlights: Conference play begins on Thursday; this year marks a switch to an 18-game Conference schedule, as teams will now play a pair of Conference games each week leading up to the OVC Tournament...After being 3-8 heading into the Christmas break a season ago, Murray State is 8-3 in non-conference play this season with a trio of road victories; it is the best start to the season for MSU since 2012 (9-3)...Belmont senior Austin Luke now has 526 career assists, first in the Bruins Division I history, and just 5 away from 10th place in OVC history...Belmont junior Dylan Windler currently has nine double-doubles, which ranks in the top five nationally...Austin Peay’s top two scorers this season (Terry Taylor, Dayton Gumm) are freshman; only Kentucky (top six scorers), Alabama, Houston Baptist and UTSA also can claim its top two scorers are freshmen...Tennessee State capped a non-conference schedule that saw it play two-nationally ranked teams (Kansas, Purdue) and two other teams (Texas, Middle Tennessee) who were receiving Top 25 votes)...Eastern Illinois senior point guard Terrell Lewis had started all 100 games of his career until suffering an injury and missing the Dec. 16 game at South Alabama; he has now missed three games but expected to return soon...UT Martin won a pair of games last week and have now won four of its last five games overall.